weavewright | An ongoing discussion of one weaver's life…..
It’s been unconscionably long since I last wrote here, which is not a measure of how little I’ve done or how blank my thought processes have been. Still, 2018 was a strange year, with some oddities and demands that have been out of the ordinary. A quick glance at the high points will have to suffice. The summer was busy, as it always is, and as I often do, I sometimes wondered why other people get to take vacations and I don’t. But then, as one who grew up on a family dairy farm where we all had work to do year round, and by the age of eleven was working elsewhere to earn money for college, the matter of summer vacation has rarely been an element of my life. You’d think I’d be used to it by now. The summer ended with the annual Whidbey Working Artists Open Studio Tour, a weekend-long event that is both exhausting and exhilarating for me. This year’s was perhaps the best ever in terms of numbers of people who came here and the level of sales and commission orders. Most of the people who came were new to my studio, and I had a fine time demonstrating and discussing the weaving process. My 75th birthday was in early September, and with the help of dear friends and family, I was able to have a real honest-to-goodness party — under a big white tent situated in the middle of the garden. Potluck food, live music, a cake with masses of candles, and multiple simultaneous conversations around me — all made for a truly memorable celebration. I have new eyes!! In November, two weeks apart, I had cataract surgery on both eyes. It’s astonishing to me still to experience the enormous improvement in my vision, and to realize how impaired it was for several years while I was being too stubborn and timid to go forward with the procedure. I have the sense that my clear vision now is more than strictly physical. Lastly, in early December I learned that I have been accepted into the Northwest Designer Craftsmen, a prestigious organization that covers a five-state area. (www.nwdesignercraftsmen.org) I had a difficult time completing the entire application process, as my “credentials” don’t match up with the standard art world criteria. I decided to speak in the application about the choices I made over the years to diverge from the path that many professional craftsmen and artists follow. And with the steady encouragement and support of a special friend, I completed it and sent it in on time. I’m still astonished that they accepted me, and very glad they did. Now, at the start of a new year, I find myself (as always) both hopeful and pragmatic. A dear friend and I have begun the process of constructing a website which will be a new location where people can see and purchase my work. This should be up and running by the end of January, and will require something of a learning curve for me to become competent at maintaining it (which will include photographing the work to be shown). Another big change this year is the addition of a studio assistant, which will enable me to be more productive overall while not being the sole worker-bee. For the academic semester, I will also be mentoring an art student from Ohio who will be studying with me and with a local painter. These two will begin to give me the long-wished-for opportunity to pass along some of what I know to others. It’s going to be a challenge to figure out how to do this effectively, so that we all benefit from it. Another learning curve. For the fifth year, I’ll be organizing the Westcoast Blazers Retreat, for weavers who work with Kathrin Weber’s marvelous hand-dyed yarns. That will take place in October, and I’m adding a dye workshop in May, at which Kathrin will be teaching her techniques for dyeing both yarn and cloth. The results of both events will be inspiring; I love the process of organizing these events. There’s more ahead, and surely some surprises. I’ll be writing more frequently this year, and enjoying it as always. My warm wishes to you for an interesting and satisfying year. As I write, it’s a lovely sunny afternoon with a pleasant breeze. I look out windows to the west and see at least five varieties of bamboo, several Japanese Maples, and tall Douglas Firs behind them. From the window to my right, I survey, past the triple trunks of a large Western Red Cedar, at least eight Japanese Maples in colors ranging from bright yellow-green to deep burgundy, with different foliage shapes on each. Past them and above is a bright blue sky and more tall Douglas Firs. The breeze is moving everything gently, and the shiny young leaves reflect the sunlight. It’s mesmerizing; this is what surrounds me indoors and out. Is this garden my inspiration? No. It isn’t. But it’s certainly the context within which I live and do my work, so it somehow relates – intangibly and secretly — to the work itself. The longer vistas are often what please me the most, especially at this most lush time of the year; the combinations of colors and textures in all the vegetation (much of it quite rare in local gardens) is certainly an expression of aspects of my aesthetic. These vignettes, a select few from this large garden, always speak to me, and rest in my visual memory. Surely they nurture and inform the work I do at my looms in some subterranean way. Even more surely the entire garden enriches my sense of color, texture and pattern as they play out in the natural world. It’s a beautiful sunny day at the end of the month, after days of rain and murk. A joy indeed. A couple of months ago, I took some of my best recent work to Stadler Studio in Langley to have Michael shoot good photos (instead of my process photos taken on the loom). The results give a good sense of the character of the cloth, the drape, texture and shimmer, in addition to the colors and patterns. Enjoy the eye candy! That’s it for today. I’m working my way back into more frequent posting, and with sustained work at the looms lately, there is plenty to show and write about. Here’s to February! It’s been uncommonly dry here on Whidbey Island, with no appreciable rain since (I think) before June. Very different from the norm, when we have reliable rain till after Independence Day. By then, the browning of fields and lawns was well underway, and my garden has been thirsty for easily two months. You can imagine how much hose-hauling and pot-watering I’ve been engaged in. I can’t tell you how much I’m looking forward to our rainy season, which probably won’t start till well into October. Still, I’ve managed to eke out some weaving. Proof follows, with minimal narrative. The Whidbey Working Artists Summer Open Studio Tour (www.whidbeyworkingartists.com) takes place August 26 and 27, so I’m down to the wire on finishing up new work and loading up the looms with fresh warps for visitors to see. The warp for these is a very fine cotton, the wefts fine tencel or bamboo. Elijah’s Blanket ~ My second great-nephew was born in March, and a promised blanket for him took far longer than I’d anticipated. The process is something called double width double weave, where two layers are woven simultaneously, open on one side and closed on the other. When it comes off the loom, it’s twice as wide as it was on the loom. (Think of a sheet of paper folded in half, then opened up to full width.) The trick is not to have the two layers joined anywhere except at the fold, and not to have a visible line of crowded threads at the center of the opened-out fabric. There are five yarns in this warp, all cotton, two hand-dyed and three commercial pearl cottons in different weights. The weft is a fine cotton. There is enough warp still on the loom for three throws, each one of which will be different. And Elijah finds it to be …….. delicious! This is a fine hand-dyed tencel warp, the first on my new AVL V-series loom. The wefts are either fine bamboo or fine pearl cotton. With the exception of Elijah’s blanket, these and much more will be available for purchase at the Open Studio Tour, where you’ll also be able to see the computer-assisted looms in action and tour the garden. The deer aren’t likely to be present. For several months, I’ve been more inclined to weave than to write, so the finished work has been accumulating, as have the photographs. This post is an attempt to somewhat catch up to where I am now, so there will be lots of pictures and only a relatively minor amount of verbiage. If you have questions about any of what you see, please comment below, and I promise to respond promptly. First off, a series of my designer kitchen towels, in colors unusual for the purpose. This began as an idea for a Christmas gift for my friend Chet Sulgrove, a musician and composer, who had just bought a stunning new black guitar, and needed a unique “guitar rag” (as he calls them) that would coordinate with the new instrument. The one pictured above is what I designed for him, liberally patterned with X’s and O’s to remind him of my fondness. The rest of the run of nine were woven over the next month or so, repeating the same three patterns with each of three weft colors (black, medium grey, and silver grey). I named this series Winterdawn. Not all are pictured below. The photos above show all three patterns woven with black, which was the most dramatic. The two greys are more subtle and quiet. The last one above is woven with the silver grey; compare it with the one immediately above it. Same pattern, but visibility is reduced. Finally, I squeezed out one final somewhat skimpy towel (number 10) at the end of the warp, woven with black and a new pattern. I think it’s spectacular. About half of these beauties are still available for purchase; please contact me if you’re interested. Next up, a series of experimental pieces, all in undyed cotton, rayon, tencel, bamboo. No name for this crowd; they’ll go to a friend of mine for dyeing using a variety of techniques and multiple layered colors. I’ve played off different fibers against each other, partly so we can see how the colors “take” differently on each. These are difficult to photograph, due to the lack of contrast in the warp and weft yarns; getting just the right angle with the light and the cloth is an exercise in patience. Each of these has a different weft yarn, and a different pattern. It was a pleasure to play around with all the changes, watching how the different elements interacted without the aspect of color entering into the equation. This is the second group of these white-on-white pieces I’ve done in the last six months; there will likely be two more before year’s end, each substantially different from this batch and the first one. It’s a reminder to me of how vast are the possibilities available with the simple process of threads intersecting at right angles to each other. 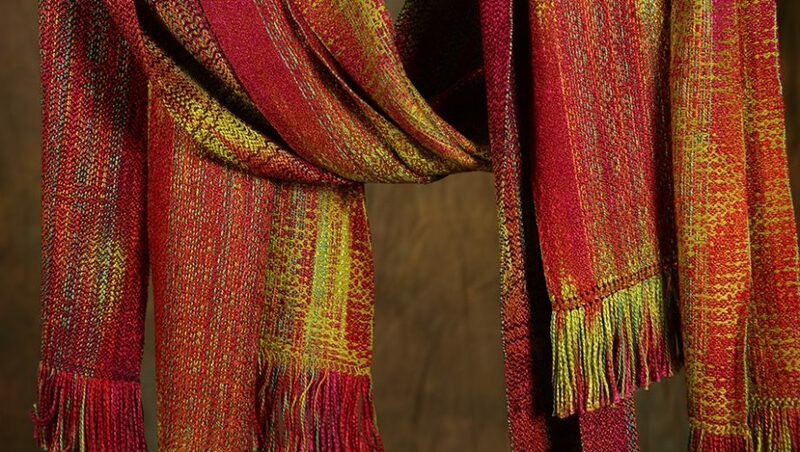 The use of a very bumpy, shiny rayon thread in the warp makes this series more interesting than it might otherwise have been; that rayon will absorb the dye excellently, so the colors will be intense, accentuating the textural effect. After this crowd, I whipped out Terrarose, a series of three scarves on a hand-dyed bamboo warp. As usual, I changed the weft yarn and the patterning for each one, and for two of these, aimed for quiet subtlety. The colors are warm and soft, the patterns more complex than they appear at first glance, and the drape and flow of the finished cloth is delectable. You may be able to see that the pattern is asymmetrical, one of my favorite design practices. These three scarves are available for purchase, along with quite a few others. My next Open Studio Day is Saturday, July 8; you can see them here at my studio, and take your favorite home with you. I also invite you to take a self-guided garden tour (see previous blog post for enticement), which will give you an idea of where some of my inspiration arises, and where some of my design aesthetic has played out. It has been a particularly lush Spring here on Whidbey Island, after what I’m told was a wetter-than-normal Winter, with enough cold spells to kill many nasty bugs and to energize most of the trees and shrubs. It’s a good week for a stroll around the garden, so I thought you’d like to come along with me. The primary feature of this garden, which takes up most of the half-acre lot, is foliage. Many colors, textures, shapes, and densities. It was planned to have as much four-season interest as possible, so there’s also the feature of beautiful bark and structure on many of the trees and some of the shrubs, as well as quite a lot of bamboo (about 40 species and cultivars) which in this climate is evergreen. At the left of the above photo is a tall green-stemmed timber bamboo called ‘Vivax’, and at the other end of the garden is a gold-stemmed one. Both are invasive and require vigilant control. Now for a bit of floriferousness, at its best this time of year. I’ll give you names where I know them, but many things long since lost their tags, and I no longer fret about not knowing. The little rose above is one of a small collection of miniatures I’ve placed on the front steps; it’s the first to bloom, but the others are hot on its pretty heels. That’s a cultivar of Iris confusa, an unusual species that prefers dryish part-shade. They’re a bit shy, and the foliage often looks rather ratty, but the flowers, though not showy, are beautifully marked and formed. Clematis ‘Ville de Lyon’. I think. In the background, Baptisia ‘Twilight Prairie Blue’ almost ready to burst into bloom. Clematis with forgotten name growing through a shrub rose. It’s fragrant. All my roses are (except the miniatures), otherwise why have them? This exquisite iris was a surprise when it showed up a few days ago. I don’t know what it’s called, and I can’t remember where or when I got it. And I love it. This is the first hanging tender fuchsia I’ve had in over 30 years. Maybe more. It’s the sweetest thing, and the hummingbirds are frequent visitors. The property is entirely (except for two fancy iron gates) surrounded by a six-foot fence composed of wire interwoven with bamboo poles. It’s a perfect support for scores of climbing viney plants, chief among them a number of Clematis, both species and hybrids. This beauty is ‘Multi-Blue’; it blooms double like this early, and usually again late in the Summer as a single. Rarely heavy with flowers, but oh so special. One of the Polish clematis hybrids. Very floriferous, very happy, with its feet in shade and its head in the sun. A blowzy, fragrant, unnamed yellow tree peony reaching through the fence, accompanied by Clematis ‘Kiri Te Kanawa’. Up close and personal with the tree peony. Luscious creature! A look at the canopy in the northeast corner as we leave through the gate. The Dogwood grove is coming into full bloom, the Vivax towers in the rear, the golden leaves of Acer palmatum ‘Katsura’ glow to the right, and in the foreground a romp of wisteria and honeysuckle cover the fence almost completely, while a few Gingko leaves nudge their way into view on the left. Thanks for coming along. In a few days, we’ll have a look at some of the work I’ve been doing during the Spring, while the garden has been burgeoning. You see above one of three summer scarves, woven in a fine Italian cotton. Bright, almost gauzy, slightly lustrous, perfectly in keeping with the warm brilliance of Summer days and clear nights. More about these, and plenty more, tomorrow. Till then . . . .
It’s been an unconscionably long time since I showed up here. The second half of Summer, all of Autumn, and half of Winter have passed through and around me; finally I’m settling back into the quiet time of year when writing and thinking takes precedence over worky-worky. It’s a relief. I completed a record amount of work in 2016, some of which you’ve seen. Today I’m giving you a lot of photos which show some of the rest though not all. If you’re interested in purchasing something, contact me in a comment, and I’ll reply via email if you give me the address. You can also find me on Facebook; look for RainShadow Textiles. Here’s to a productive, satisfying, active year for us all. The above white-on-white series are part of a collaboration I’m working on with another weaver/dyer. They are not for sale, but if the idea of this kind of subtlety tickles your fancy, I can certainly do something like them as a special order. The two pieces above are part of a series of three scarves, in rayon and tencel. Shimmering and fluid. All available. The first of the above three was a custom table runner; the other two (more clearly different in reality) are scarves, a bit wider than the norm. Rayon, tencel and hemp, with subtle texture and a lovely sheen. Both are still available. Till soon . . . .